Location = UNION GLACIER !!! Wind speed / direction = 5-20 S.
True to form our final day of the trip proved to be far from easy! At 5am it was clear and very cold. Within an hour we were ready to go. We began preparing the big kites, but the wind started to increase drastically. Mark & Jean launched the smallest kites and we got what we hoped for, some high speed, solid gold kite footage. We blasted 20km in less than hour into the end of the Horseshoe valley. A jaw of jagged peaks, almost closing the path ahead but for a series of cols between the tooth like peaks. We couldn’t tell, from the line on our GPS, which col we were aiming for as we left the plateau terrain and entered the mountains. Almost immediately the wind matched the terrain. Plateau wind is good for kiting but Mountain is not. Turbulent, gusty and temperamental, oh and uphill. We were becalmed for half an hour. We discussed walking the last 5km to the col, still pulling 120kg in 10cm of soft snow. We unanimously decided to wait and pounce on any gust of wind. We changed kites and waited, frustrated! It took 3 hours to cover 3kms before somebody flicked the switch and the wind turned on and we climbed the last steep section to the col in 10mins. It was magnificent; the peaks of Horseshoe valley behind, and the great Plateau beyond. In front, the snaking Henderson glacier, flanked by the painted rocky faces of sculpted mountains, spilled down into the vastness of the Ronnie Ice shelf. The wind funnelled through the col, and distracted by the glorious vista, I crashed my kite resulting in a double bow tie. This is not good, in a steep windy col with a hugely overpowered massive kite wing. Normally you would anchor the kite and walk to it to untie the mess. That is mighty difficult in a precarious place with so much wind. Thankfully over the course of the last 50 days & 1000miles I have become extremely proficient at untangling kites with the control bar, mainly as I have had much practice! I was quite pleased with myself for managing to intentionally untie the double bow and launch the kite again. About 500m later I caught up with the guys, and as we crested the col, beginning to descend the wind went nuts, and we immediately all released our kites onto their safety lines, resulting in an epic kite tangle. At the same time, Jean broke his binding toe piece, 20km from the almost visible finish line. We popped up the tent and before Mark and I had finished our cheese and biscuits, Jean had located the spare and replaced the broken unit. After lunch Mark, who spent years as a ski patroller, gave me a quick briefing on how to ski downhill with a litter; or a heavy pulk. I was impressed how well it worked and we descended 6km of blue/red run terrain with refreshingly little difficulty. As it flattened out we launched our mid-size kites and began once again battling with erratic mountain air flows. Once again after a frustrating hour it came good and we blasted the last few kilometres of the glacier and crucially up the short steep hill to the Henderson col leading to Union glacier. Well Jean and I did, Mark ‘kite-mared’ just below the crest and had to walk the last bit. Meanwhile, Jean and I overlooked our final destination, the ALE Union glacier camp, suddenly visible 6km distant. 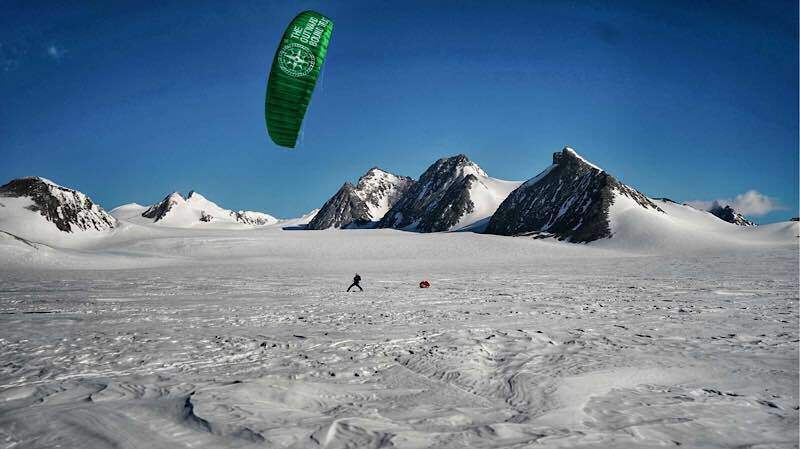 We regrouped, packed the kites and skied the last 100m to the glacier. The dangerously crevassed area we were concerned about was a non-issue thanks to the snowmobile track and flags marked by ALE for their Antarctic marathon event a few weeks ago. With the end in sight, a good, hard surface and no wind; we got the message, popped the skins on the GS skis and began the victory march. It was at least 15C warmer than the morning and we were melting. A twin otter came in to land and spotted us. It circled us and gave us wing wave before landing. 10 minutes later, Fred arrived on a snowmobile. With just 2kms to go, we decided to pass off the pulks and skate without weight to the end. A bunch of people came out to give us a warm welcome. And it suddenly it was done. The toils and troubles, and wonder and joy, of the Spectre Expedition, immediately confined to memory. 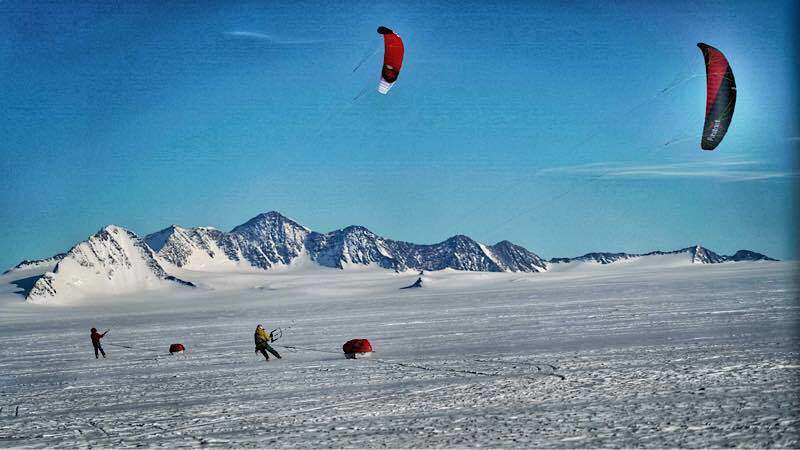 50 days self-supported in the deep field – 1600km by kite, less than 100km man-hauling. And we climbed the Spectre. Best of all Jean, Mark and I had a ball out there at the end of the Earth. It was really very tough, especially the first 20 days. We are a pretty seasoned crew and we pretty much maxed at the start. But we kept enough in reserve not only to stay safe but to do everything we set out to do, and to do so smiling. There are lots of people I’d like to thank: supporters, family, friends, followers… but I’ll spare you just for now. And without the generous support of sponsors and trust donations, this adventure would never have happened – investing and backing something so uncertain – we hope our efforts have met your expectations. Jean, Mark – thanks, that was awesome. I couldn’t imagine a better pair of partners, nor a more challenging adventure. The reason we are here safe and successful is because we formed a fantastic team and had a massive laugh overcoming at times overwhelming obstacles. You are a pair of winners. OK, so I’d also like to thank all you out there for reading this and following us. I hope you enjoyed the ride and we were able to share something of this savage Antarctic wonderland. We have shot some amazing footage which we will release as a film in the autumn. We’ll post some high res imagery and a few video tasters soon. Please keep your eyes peeled for updates. Leo Houlding aka Captain Faff, Spectre Expedition, signing off. Une superbe aventure humaine dans un environnement d’exception à tous les niveaux. Good effort un doing all you intended ,but also for having fun which is what it’s all about . Enjoyed reading your blog . Back to sunny lakes soon .. Wow!! Congrats to all the team: you did an amazing job! Shackleton would be proud. Well done team & welcome back to the world! Excellent history you have helped create, but getting home to the wife and kids after adversity is the best success. Post trip Blues and family who have moved on a little are all now discover. Looking forward see the film. BRAVO! 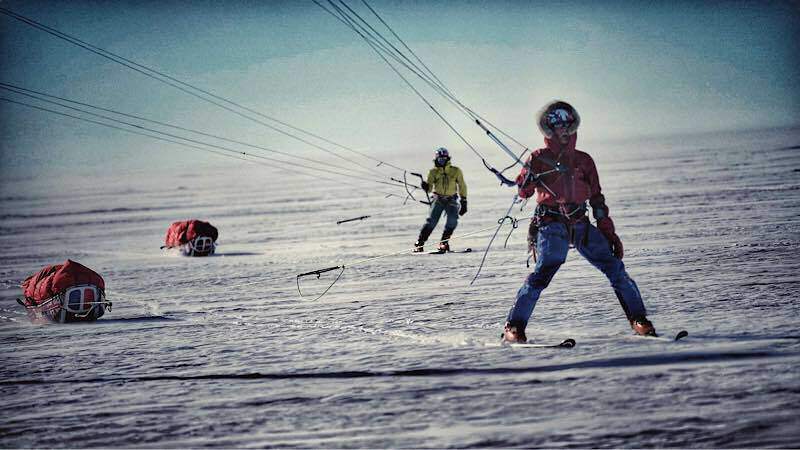 Here’s to the PULKS thatcarried all your kit; here’s to your SKIIS that carried you and here’s to those occasionally recalcitrant KITES that harnessed the wind to propel you along on your journey. Such faithful companions. Well done all of you! Absolutely brilliant! I came to this story late but was riveted. Having read your column in the FT at the weekend I had to know where you were. I am pleased you are all safe. What a fantastic journey and achievement and so well told. Well done! I have to admit I read this last post with a growing grin on my face. absolutely awe stuck, what a mission completed in fantastic style. Looking forward to hearing/ seeing more. See you back in the Lakes soon, all have a safe trip home! Really well done. Ohhh my gosh you guys had me going no news for TWO days I was biting my nails searching all over the net for SOME news but nothing and just now in came your blog How WONDERFUL it was to read 0ks to go!!! You were home and safe, with my heart pounding I read your blog and all was well with you all and though it was a hard slog in you are back. Thank you for locking your self away from all the crazy ness going on around you when I’m sure you would rather be amongst it To write so we know you made it and how it finished, in these weeks you have become part of my life and you seem like my boys out there. Having sons who have lived a lot on the edge I felt your ups and downs and I’m just glad you are home safe and will soon be back in family and friends loving arms. Thanks for the most incredible journey in my 70 years off travel this has been the most inspiring, breathtaking, magistic, and scary oneLOL. Cheers Glenda Down Under. Absolutely awesome chaps. A brilliant concept, safely carried out, and with the added bonus of daily blogs – which must have been very onerous at times. So pleased for you all, having lived your dream (one of them at least). Following you has been an absolute joy. Fantastic, tears in my eyes. Wonderful news, the silence yesterday was nail-biting. Thank you for putting so much wisdom and endeavour into action, great contributions to all our well-being. Safe onward journeying. Congrats guys ! Waiting for you to tell us the story’s underside. Good rest, good beer, enjoy the toilets and the shower, and all the facilities of life !! Whoop whoop- so proud of you all. So many hours/days/weeks & years of careful planning and preparation. Then nearly 60 days of hard work and hostile conditions on the ice! What a fantastic achievement. Can’t wait to hold you again and have a 4 person party in our living room – watching Jackson (now on the move) and Freya dance with us around the room. Love you to Antarctica and back again 💜. Ça y est j’ai sorti les larmes! Merci tous les trois pour le partage si souriant et énergique de votre aventure! Nous les lecteurs aurons ri, stressé, espéré, éclaté de joie, été soulagé, pleuré, été tenus en haleine, été inspirés par vos écrits et récits, franchement HBO et Netflix peuvent aller se rhabiller… on vous embrasse sur vos joues poilues. Thank you so much for allowing us to follow the adventure with you. I suspect I’ll check in out of habit over the next few days. It’s been fantastic to hear your progress and to share the journey with you. Wishing you safe travels home and some great times with your families back home. Will look out for the videos and promotional stuff in the Autumn. Thanks again! Enjoy your rest and recovery. We’ll done lads, can’t wait for the book and film tour. Get some bacon butties in yer and a nice pint of bitter. Did some climbing in Calp a place called Tiox ever been there? Brill limestone rock plenty of holds and bolts. A GREAT BIG CONGRATULATIONS !!! Have a spot of bubbly.. Totally Wonderful!!! It’s been so exciting! Thank you. Fantastic ! We have followed you all the way , well except the Month’s of Prep , getting Sponsor’s , Sorting out the Travel etc etc etc etc …… What can we say ? Other than Fanbloodytastic Lad’s ! So glad you are all safe and sound , Enjoy the Shower’s and Toilet’s , Marvellous Invention’s . Sleep well . F,J,J, daddy is coming back!. Welcome back to the world guys! Amazing trip. Very few humans could pull off what you did. Warm up, fill your belly; kiss your family then start planning the next adventure!!! Whooho CONGRATULATIONS! Well done team! Fantastic. Well done. You have achieved something remarkable in this day and age of heading off into the land of the remoteness. I hope your personal experience stay with you forever. I for one have been massively inspired. I add my slap on the back to all the others. The words and imagery of this last blog surpass the stream that went before. Can’t wait to see the film. 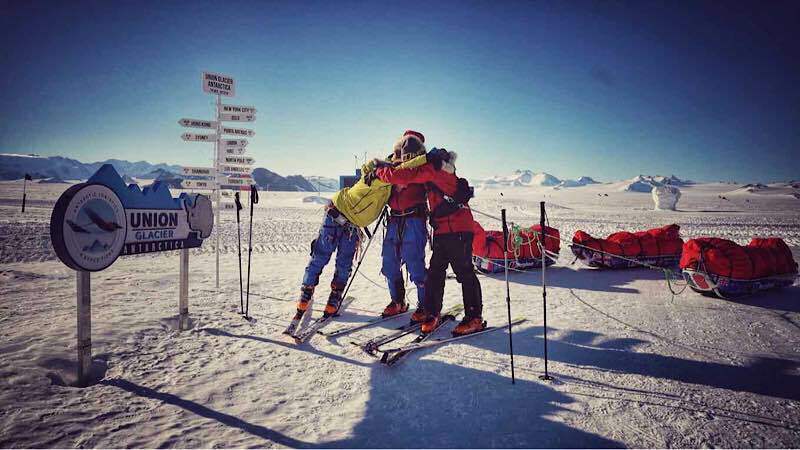 What a classic, classy ending to the saga – a flagged route through the last crevasse field and humanity again. Mark and Jean, you pulled it off. Leo, you da man! Jan Dobbie (Sedon) aka Intrepid explorer’s mother! Well done Leo and team! I wonder what it’s like being on your own in the middle of nowhere with just two other people!? We (at Windermere School) have got a little surprise waiting for you! We (Year 4) have been learning about the environment in the Antarctic and what the weather would be like. Not as nice as in the Lakes! Bit of a nail biter at times but you all came through ok. What a story. Great days! Wow, what an adventure. Congratulations on all you have achieved and for the style you achieved it in. Thank you so much for taking the time to write such insightful and beautifully written updates, they’ve been a joy to read and of course the pictures paint a few thousand extra words. Your dedication to every element of this expedition has been a joy to follow, you deserve all you have achieved. Enjoy the showers, drinks and the joy of a meal that someone else cooks. Well done legends, it has been so inspiring following your adventures, and your final note brought a flood of emotion and stoke, you are privileged to have experienced such an amazing kiting adventure in such raw beauty and cant imagine how tough it must have been. At the end it has been an absolute privilege to have share in it through your beautiful crafted texts. So look forward to seeing that footage, spectacular i’m sure. It has been awesome to have these daily blogs to wake up to share in your adventure with you along the way, to make the 50 days go quicker? and get a feeling of the hardship and toughness you guys are going through. 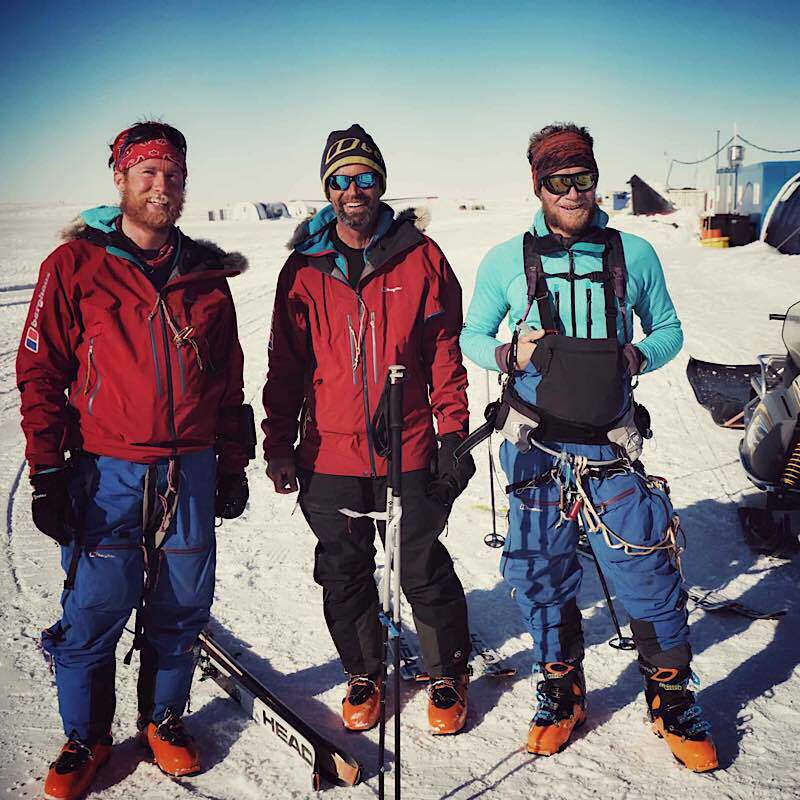 What a tough expedition and you guys have done it, well done, what a huge accomplishment, I am so proud of you guys! Now I am looking forward to having my hubby home.